Bring a large stockpot of water to boil. Add chopped cauliflower and whole cloves garlic. Simmer until cauliflower is fork-tender. Drain and remove from heat, mash with a fork until cauliflower and garlic are completely pureed. Add chives and Greek yogurt, stir to incorporate. Meanwhile, heat a grill pan over medium heat. Spray or drizzle asparagus with olive oil, salt and pepper. Grill until just done and still crisp. Meanwhile, in a saute pan, heat butter until foam subsides. Season scallops on both sides with seasoning salt. Place scallops in pan and do not move until they can be moved freely (not sticking at all). Turn over and remove from heat. The heat of the pan will continue to cook until perfect. To serve, mound approx 1 c cauliflower puree in the center of the plate. Top with asparagus spears, then scallops. Garnish with chives and serve immediately. This entry was posted on October 8, 2010 at 12:32 pm and is filed under Cooking, Family, Friends, Random, Recipe. You can follow any responses to this entry through the RSS 2.0 feed. You can leave a response, or trackback from your own site. Hello Amanda! This one is simple enough for me. And I love scallops. 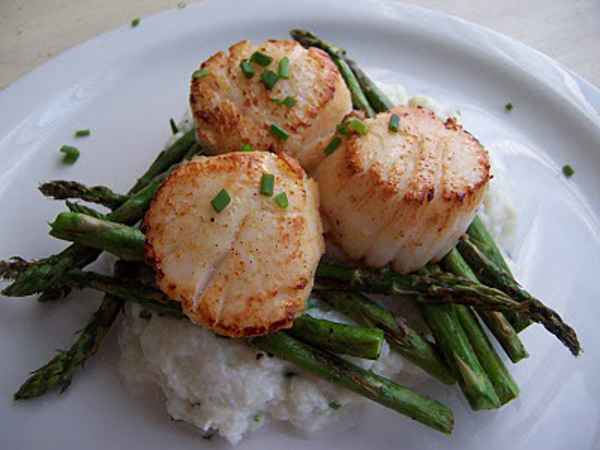 Thank you for sharing this recipe for delicious Scallops with Cauliflower Puree and Asparagus. I can’t wait to try it. This looks great, must find a local fishery store that sells scallops! I hope you do…I made another one (recipe today) am addicted to seafood!! Not good for the old ticker they say but cannot resist!! Yummy!!! Two of my favorites – scallops and asparagus!